To be a successful business leader, executives need to make values-based problem solving a habit of mind, argue management experts and Notre Dame professors Viva Bartkus and Ed Conlon. 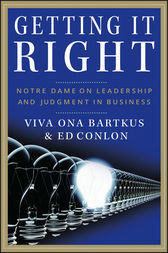 In Getting It Right, Bartkus and Conlon draw on insights from consulting, management, and academia to deliver a powerful message: no matter how chaotic the marketplace, leaders can still address even the most staggering challenges in a calm and confident manner. Viva Ona Bartkus, is an associate professor of management at the University of Notre Dame. Prior to joining the faculty at the University of Notre Dame, Dr. Bartkus spent ten years at the global management consulting firm of McKinsey & Company—the last four years as a partner. Edward J. Conlon, joined the faculty of Notre Dame in 1992, served as chair of the management department until 1998, and as Associate Dean for Graduate programs since 2003. In addition to teaching in the Executive MBA program at Notre Dame, he has conducted executive development workshops with leading organizations.